Mail messages which Mailtraq determines cannot be delivered locally are placed in the Outgoing Mail Queue - sometimes called the 'outbox', displayed in Outgoing Mail in the Console List View for delivery to a remote mail host. Messages to local users skip this step and are routed direct to the user's mailbox. Mailtraq uses the Domain and Domain Alias settings at Options | Server | Domain-tab to determine which domains are local. Messages that are determined as local but for which there is no user-mailbox will follow the Undelivered mail rule, configured in the Outbox Properties dialog. Mailtraq evaluates each message as it arrives in the outbound mail queue and applies the mail delivery policy settings configured in the Outbox Properties dialog. Mailtraq will automatically retry, and keep retrying, to deliver these messages, and eventually will notify the sender that the message has been delayed or refused. Some large mail hosts are very strict about complying with their particular terms and will reject or delay messages if you do not. Selecting Clear Host Assignments (Trad Console) or Clear Route Assignment (WiX/MMC Console), from the context menu (right-click menu) of the Outgoing Mail queue-object in the Console List View or from the File Menu, prompts Mailtraq, when the outbound router is next idle, to remove the current outbound routing information from every message in the outbound mail queue and to reapply the message routing policy. This is in effect forcing a retry. Observing the 'talk-back' in the Event Log allows you to see what happens when each message is retried. This is useful if a dynamic or static route has been added, deleted or reconfigured in the Static Routing Table. If no changes are made then the existing message Envelope information is used. Messages are then resubmitted to the internal Router. This lists messages that have recently been processed in the outgoing mail queue. Messages are visible in the status report from about a minute after they have arrived in the Oubox and have been Routed. The Outbound Status Report is designed to make it simple to see how messages have been handled and why messages may not have been routed as expected. The report contains the same information as is held in the main Mailtraq Event Log, but in an easy to read and follow format. If you are delivering messages by MX Resolution, it is not unusual to see a 'few' messages queued in the Outbox. This normally means that the destination is temporarily unavailable. Mailtraq will normally manage mail server failure and other message failures automatically without User intervention. These SMTP 'conversations' are recorded by the Mailtraq Event Log, which you can examine to determine why any particular message is 'stuck'. If your installation is subject to an attack through mis-configuration, or through a virus or Trojan infestation, you can have a situation where there are many thousands of messages in the outbox. 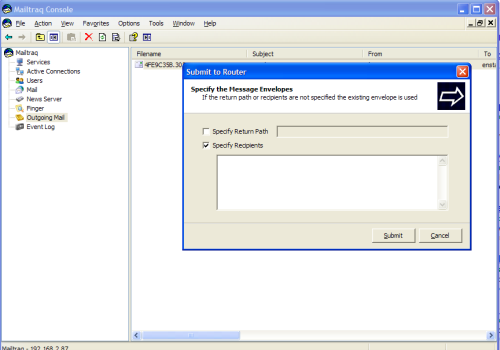 This article KB07091801 Clearing the outbox explains how to empty the outbox if the Console becomes unresponsive. When the route is completely resolved, Mailtraq will have a list of hosts to send the message to. When delivery starts it contacts each host in turn and attempts to send the message. If Mailtraq cannot connect to a host, or the host responds with anything other than a permanent (5xx) error, then Mailtraq will attempt delivery to the next host in line immediately. If after attempting delivery to all the hosts the message still hasn't been sent, then the message is marked as delayed for the "Retry period" specified in the route. After the "Notification period" has passed, the icon will become and a delivery delay notification will be sent to the return path. After the "Retry Until" period has passed, the message will be erased and a delivery failure notification will be sent to the return path. If the return path is blank, no DSNs are sent. There are cases where retries can take place more often. For example, if Mailtraq is getting errors from the MX resolution or invalid MX responses it may retry those more often based on either the TTL of the record or a nominal period (few minutes). Add Mailhost to the columns displayed. This information is useful when diagnosing problems with mail 'stuck in the outbox': you may find a common mail host is causing the problem.